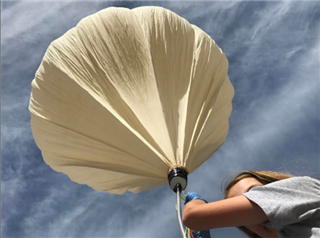 On Mother's Day, Conceptual Physics students and faculty had a narrow window of good weather to send a weather balloon 100,000 feet into the stratosphere. Students designed scientific experiments to study the impact of high altitude, temperature, pressure, radiation and light intensity, plotted flight paths using balloon flight modeling software, and set up an onboard GPS and live stream to broadcast the entire process. After the balloon expanded so big that it popped, it descended using a parachute into the Imperial Valley. The weather balloon required a flight plan with the Federal Aviation Administration and managed to fly three times higher than a commercial jet. There was even a nice Mother's Day message attached!